A wake is better than a funeral. Rather than finishing with the necessary sadness of the previous entry I discovered this fragment of writing that I wrote – I hazard a guess – perhaps in early spring of this year. It seems an appropriate way to end this journal, re-directing us towards the beauty of boat life and why we all do it to begin with. “I feel that I should record that, for no particular reason now more than ever – I really love Hawisia. There have been times when I have doubted the boating life – found it too difficult, too draining. But now the gentle rocking of my boat is one of the few true pleasures that I have to look forward to when I return home from work. The smell of old cinders and smoky wood fills my brain like a cloud of ambergris, the worn armchair, in its place, offers an envelope of calm peacefulness that counteracts the trials of the day. The scatter-gun effect of rain hitting my roof like a thousand tiny plastic pellets, is a kind of familiar melody, which brings, oddly enough, comfort. The miniature tornados of wind which throttle down the chimney and rock the boat, one way, then the other, are almost old friends. Sometimes the wind lures and draws the flame of the fire into a fine, silken tongue through the shaft of the chimney, but at other times a downwards draught can stamp out a fire like a blot of black ink. Then puff! And a globe of smoke appears from underneath the stove riddle, which gradually fills the boat like church incense. The sound of wind whooshing and flooing down the chimney, the whistle of the kettle, the ephemeral but soft feather-like brush of Behemoth’s tail against my leg: these are the pleasures of boating not to be forgotten. Then the sleep upon water, oceanic yet still, is far better than any sleep upon land. It is a kind of elaborate return to the womb, this life upon water, but not in a fleshy but hard shell – returning us to the universal memory of the mother. This is a very difficult and sad entry to write – not least because the loss of the boat has been only one of among a number of losses I have suffered this week, losses of the subjects and characters that coloured and constituted my life, identity, my love. Now I have lost Gideon, the Boat and Behemoth: the three points of my water-borne trinity. The feeling of loss is almost too difficult to bear or begin to write about, but as this boat blog had a beginning – so it shall have an end. The re-homing process had been a long one. Overall it has taken a month from my leaving the school in Wembley and beginning to redecorate the boat (inside & out) to the point where now, I have finally looked upon her for the last time and wished her new owner the very best of luck. It has been a month of drifting and mental vagaries: a month of labour in the sun beside Victoria Park, interspersed with driving lessons, strong lattés, the occasional conversation with friends at the Pavilion Café, a few jogs and a medley of meetings with hopeful boat-owners. Throughout this time Gideon was away on a family holiday and so my time alone with boat and the cat, and my own exhausted mind – fogged with thoughts of school and summer exams – was dominated by a sense of excitement about his return, as well as a slight trepidation at the thought of the bleary and undefined future that awaited us all. Though there were some moments of fear or loneliness, in general, this was a time of quiet, systematic work, in which I managed to relieve a degree of the admin and paperwork that had been building in the ‘desk’ corner of the boat for some time. Every home-owner will recognise this ordeal, the fuss and nonsense of changing your home, contacting the insurance, concluding the bills. But I was not just carefully tying up ‘Hawisia’: I was mining a newly updated personal identity. It was as though the energy of the boat sale had galvanized a much more profound and intrinsic desire for inner change and restoration. Therefore each letter, each new application or cover letter, announced a shiny, new, film-packaged ‘me’ – or at least a potential one; from the pastel shades of my new driving license to the soft leather jacket-cover of my new passport. I had elicited a kind of paper-work transformation or metamorphosis of myself. I realise now, how bleak this sounds, and how polarised I felt at that time: as though the very water, stricken with sun and rubbish, had begun to signify a dualism to me; both restrictive and nostalgic. The sense of lost scale was ramified by the intensity of my meetings with others, the psychological burden of the ‘sale’ and the sense of being so far from Gideon – my centre of gravity. Perhaps, all these feelings, more plainly summed up as being lost and disorientated, are ones we can all recognise in situations where we have been obliged to remain amongst the places and objects we have internally determined to say goodbye to. Who can compass the metaphysics of loss? The gymnasium of emotions, trauma, hope. I cannot even comment on what happened with Gideon, the sudden absence, like the loss of a body part, creating an absurd fissure bordering on the irrational – a pain which bound the mind to the body and made me feel constantly hollowed out and sick. Suffice to say that the trauma of that goodbye, squibbed out the pathos of the boat-departure; though I did find the hardihood to throw a leaving party so as to wish her a formal ‘farewell’. Perhaps when I have a little more perspective on the event, I will be able to write a more philosophical goodbye. However, that night on which, I was pleased to see my friends were at least enjoying themselves, where I, at heart, could not – wryly reminds me of the necessary destruction that change brings, the unpicking and unmaking to re-make that you have to do with your life, as poor folk used to do in the past when they wished to recycle their clothes. So Hawisia’s formal goodbye was toasted by the banks of the Lea, beneath the silverlink railway bridge which transverses the river, very close to the Anchor & Hope pub. Before the mental picture fades into darkness, I will recall it now: the smiling faces of my friends sitting in a ring in the high grass, the rumble of the occasional train and stuttering sleeper frets singing beneath their heavy weight and the long, low blush-pink sunset which bled out a scalpel-thin edge of cloud; bruising and staining the sky with colour. Normally such fine sunsets do not presage bad weather, but that was the night of the great ‘electric storm’ which passed across London. So as Theo lay quietly on the make-shift bed and Gideon and I lay quietly in our own; ruminative, sad, sweaty; the night-sky performed its very own operatic symphony – in honour, as it seemed then, of the great tragedy of our ending, and the boat’s ending and the ending of the story altogether. So huge, cracked forks and shivers of silver light fraternised in the rain-soaked air, great veils of rain fell like hail upon the water and steel body of the boat and mighty tremors of thunder passed over our faces and skittered along the riverbank. The next day, warm, clear and mild, allowed us to sit together, like compatriots, eating a cheap fried breakfast on the Cambridge Heath Road. Then each tiny day passed, 3 in total, like pinches or heart-beats, rationalised down to clearly defined ‘tasks’ so as to omit as much pain as possible. Each object that made Hawisia our home was carefully extricated and packed away, till only the husk of the ship remained, painted a sterile glossy white. I dusted the shelves, scrubbed the windows, gave away the garden, apologised to the cat. Then, in just a few tasks and heart-beats later, she was gone. I thanked the bin-men, shook hands with the owner, looked upon her for the last time beside the lime-green bridge. Weary of the sadness, weary of the sorrow, I took my bike and trailer and started the long cycle ride to my parental home in Camden. 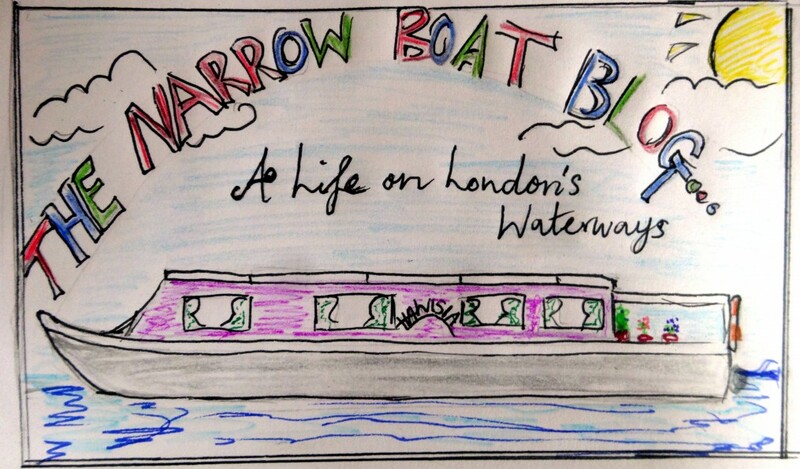 It was time to start a fresh adventure, a new chapter in my life – leaving the waterways of London behind me for good. So fare thee well my own true love, when I return united we will be. It’s not the leaving of Liverpool that grieves me, but darling when I think of thee.